Seniors from the FADE program performed a variety of musical selections, monologues, or dances for the Senior Showcase on Wednesday night (February 9th, 2011). Video by Cathy Anderson ’12. Les Miserables, by title alone, may seem like a morbid, depressing play. But though the plot consists of deaths and heartache, the characters sprang to life by the brilliant skill of the actors. 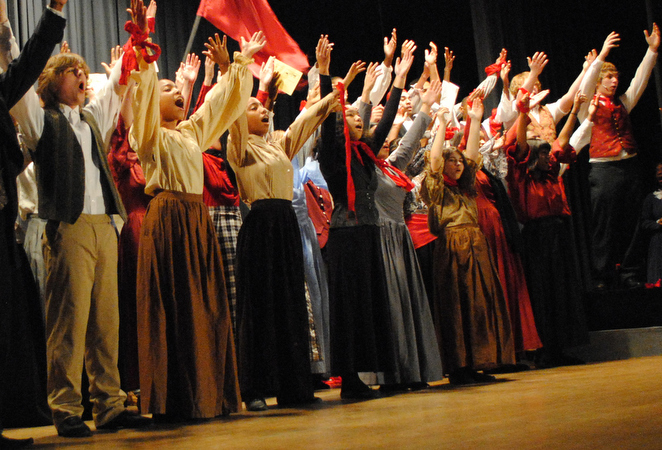 After months of hard work, the Bishop McNamara production of musical Les Miserables which opened on November 12, was a success. This was the first fall musical I attended at Bishop McNamara and it did not disappoint. As everyone took their seat, the air was full of anticipation and excitement. The pit orchestra began to play and the curtain opened to reveal a beautiful, rustic set that transported the audience to 19th century France. Each character introduced possessed their own distinct personalities that resonated with the audience.The prop design and costumes alone transported the audience to 19th century France. Les Miserables was directed by Mary Mitchell-Donahue. 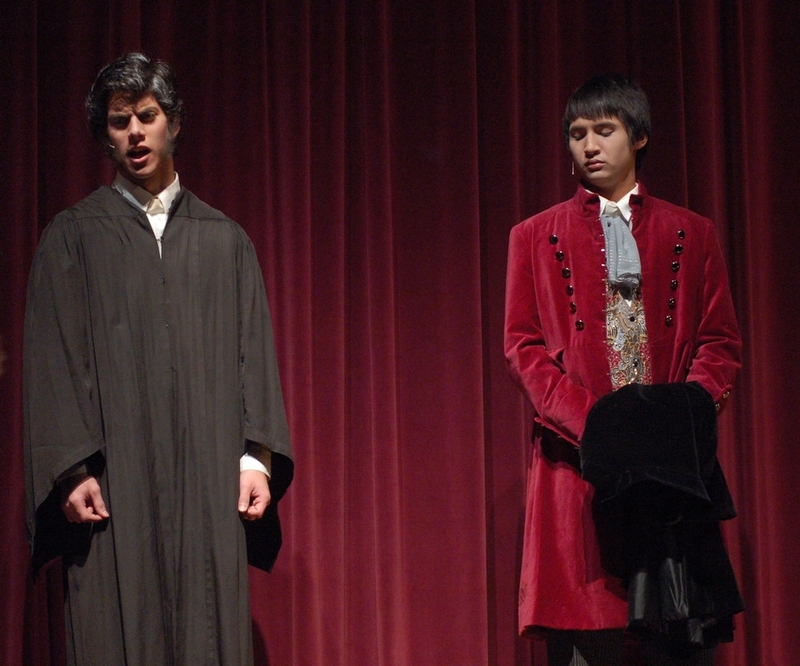 My favorite quote comes from the scene when Javert, the inspector played by Michael Mathes ‘11, after a lifetime of looking for Valjean, decides to take his own life: “ To owe life to a malefactor…to be in spite of himself on a level with a fugitive from justice…to betray society in order to be true to his own conscience that all these absurdities…should accumulate on himself. This is what prostrated him.” Javert only sees the law in black and white and is torn by his relationship to Valjean and following the letter of the law. In the end, this confusion is too much for him to handle and he commits suicide. 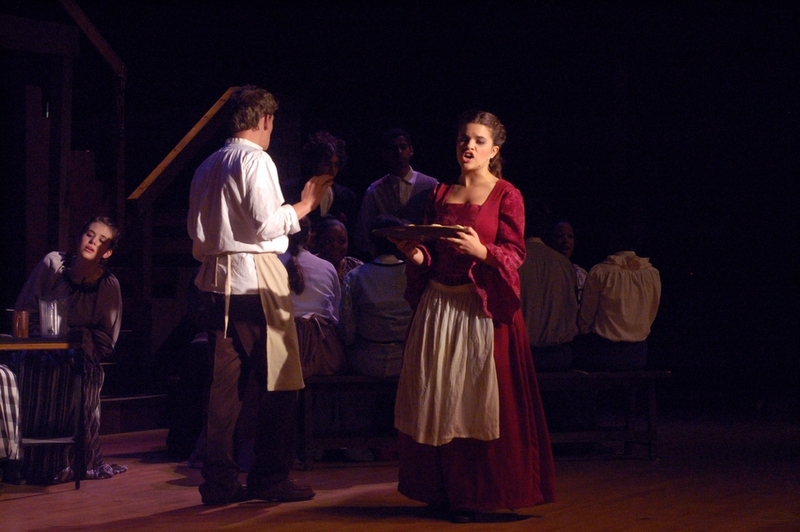 One character that really stood out for me was Eponine, played by Briana Barber ’12. 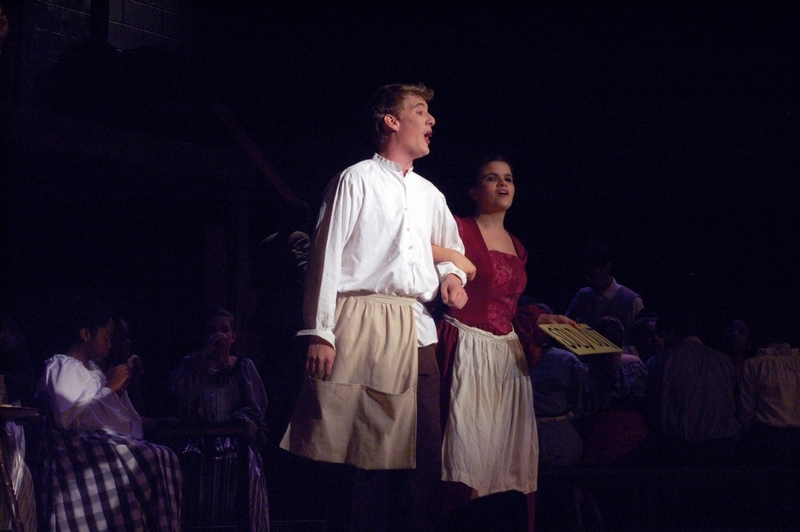 Eponine was the spoiled child of Mr. and Mrs. Thenardier, the greedy innkeepers. In her adulthood though, her selfish persona changes with the love of another. 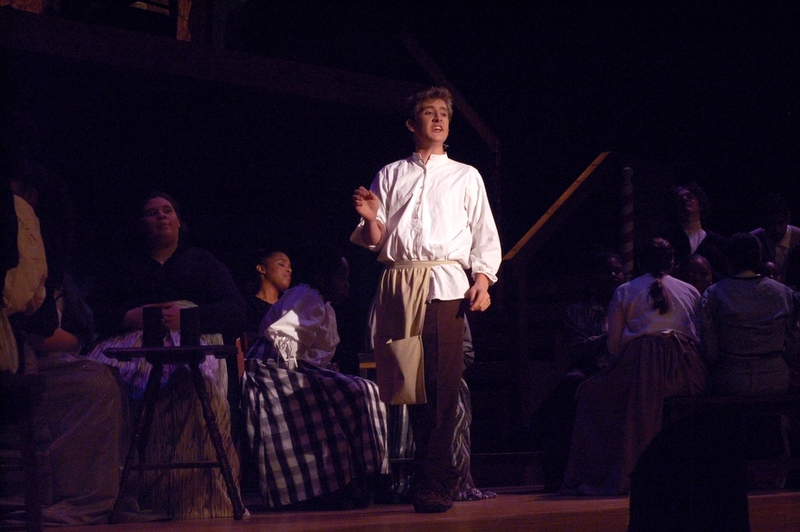 Barber expertly portrays a character who has experienced several years of heartache and lost. 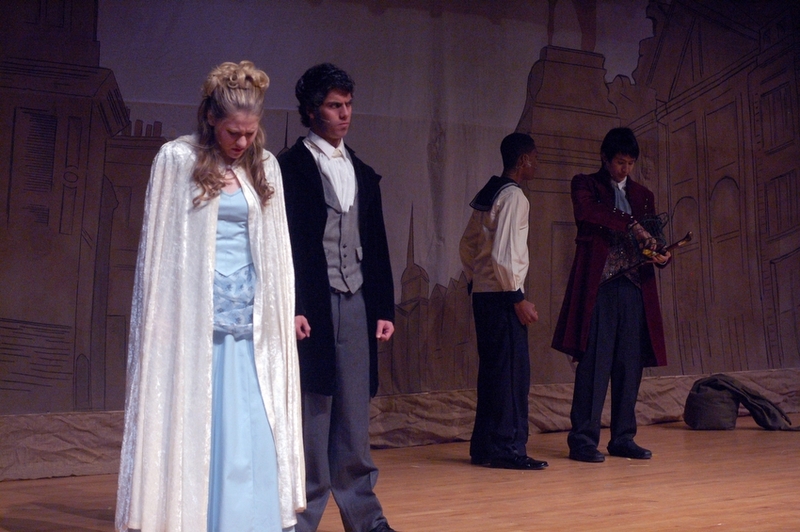 In the scene, “A Heart Full of Love,” Barber’s character Eponine suffers through the agony of knowing the love of her life is interested in the beautiful and wealthy Cosette. Through her singing, the audience could easily empathize with her pain. The performance of lead Austin Holmes ‘12 was extremely impressive. Jean Valjean, the main character, is followed from his days in captivity in jail for stealing a loaf of bread, to his respected position of mayor of a small town, finally to his life as an adopted father. Holmes’ commitment to his character was outstanding. He acted with a maturity that is not expected of a high school student. Mary Mitchell-Donahue, director and costume director, selected the fall musical. During the four year time period, she wants to expose students to diverse types of plays and musicals by alternating between modern and traditional. Les Miserables was selected for many reasons. This musical has many great characters, solo parts, and a good balance between males and females roles. After bringing the idea to Mr. Anthony Conto, band director, and Mr. Dominic Traino, vocal director, Donahue learned they were really inspired to take on the challenge. The pit orchestra, directed by Anthony Conto was the icing of the cake, providing the appropriate atmosphere to the different scenes. Each song melded seamlessly with the actors’ scenes. From the violinist to the percussionists, each member demonstrated an impressive level of professionalism. The music eloquently melded into the scenes and the actor’s songs. 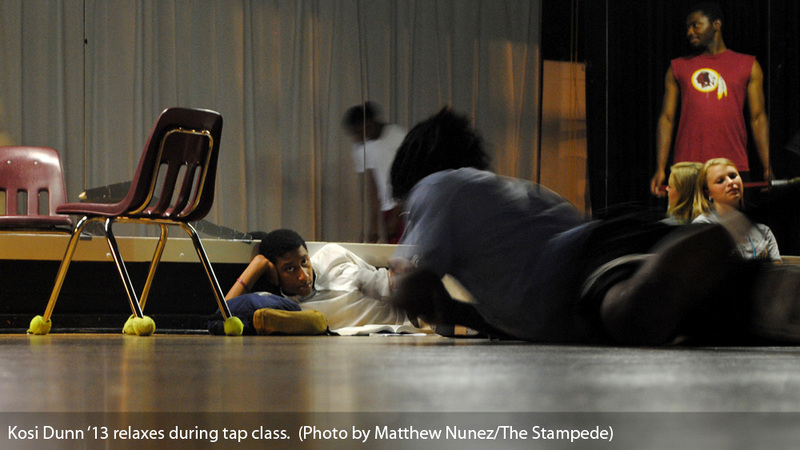 The staging, lightning, and props really brought the play together. Mr. John Shryock, sound designer, headed all of the behind-the-scenes action. The tech crew, dressed in all black, moved quickly to transform scenes. Les Miserables is based on Victor Hugo’s classic novel of the same name. Passion, humanity, death, and love fills this story as Jean Valjean, a fugitive, escapes captivity from Inspector Javert. Les Miserables is the winner of over 50 international theater awards, including eight 1987 Tony Awards (two of which were for Best Musical and Best Score). “To love another person is to see the face of God.” Even though this play is shrouded in heartbreak, death, and unfortunate circumstances, the theme is love. With love, these miserable people have found a reason to thrive. Senior Jesse Marciniak, and Junior Lauren Turner pose in a love scene. Racial tension, military hardships, and the pressures of love. Though South Pacific was written sixty years ago, its themes are still relevant today. South Pacific’s opening night was November 13 and was performed a total of five times over the course of two weeks. 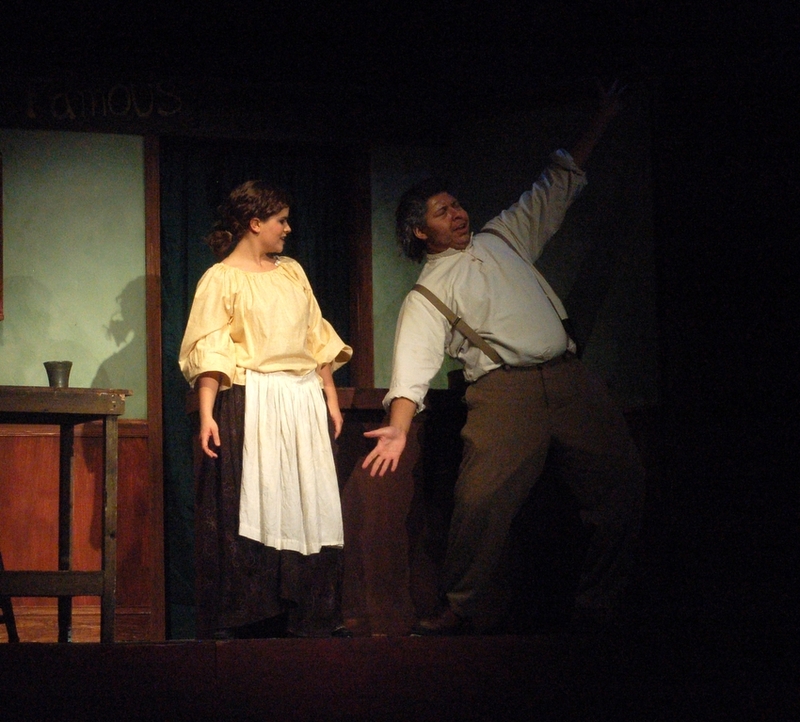 Considering the play ran for only two weekends, it was widely attended. The lyrics and music for South Pacific were written by Richard Rodgers and Oscar Hammerstein II, and the book by Joshua Logan. The original Broadway version of the musical won numerous awards including a 1950 Pulitzer Prize for Drama and ten different Tony Awards. This show has also won awards in multiple foreign countries. 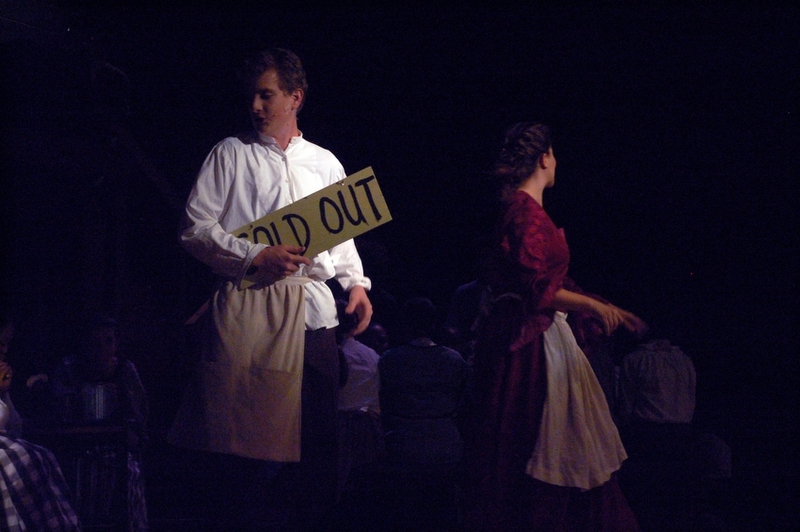 The main characters in the play were Emile De Becque, a Frenchman played by Dillon DiSalvo; Nellie Forbush, a woman deployed to an island in the South Pacific played by Jacqueline Wills; Lieutenant Cable, a military man on deployment to the island played by Jesse Marciniak; Bloody Mary, a Tonkinese woman who sells souvenirs to Americans played by Mylah Howard; and Liat, Bloody Mary’s daughter who falls in love with Lt. Cable, played by Lauren Turner. Though all the actors and actresses are common students in high school and have busy schedules, the parts were acted with great respect and dedication. Despite the fact that this play is difficult to convey emotionally to the audience, especially since it deals with such difficult and current problems, the actors portrayed the parts well and clearly used a lot of talent and practice to get there. In fact, the Bishop McNamara theater practiced for two months prior to the production of the play, even staying until nine o’clock every night the week before opening night. Throughout the play, Emile and Nellie fall in love and deal with the fact that Emile has two children born of a Polynesian woman. Unfortunately, Nellie was brought up in a household where diversity was not accepted. Nellie and Emile get to know each other and Emile proposes. Nellie, however, cannot shake off her prejudices and declines the offer after finding out about his Polynesian children. In the mean time, Emile is asked to help with a military operation on an isolated island. Though at first he declines because he plans to marry Nellie, he later accepts, unbeknownst to her, after she calls off the engagement. While he is on the mission, Nellie looks for him, after realizing she still loves him. After learning he was on a military mission, she thinks he is dead, returns to Emile’s house and befriends his kids. While they are having dinner one night, Emile comes back home and surprises them. Nellie apologizes, the two resolve their differences, and plan to get married. Meanwhile, Lieutenant Cable and Liat meet and immediately fall in love. However, when Lt. Cable is faced with either marrying her or allowing an alcoholic to marry her, he declines the proposal because of her ethnicity. Lt. Cable is also part of the same military mission as Emile, but dies from injuries he sustains from enemy attacks. Unfortunately, Liat is still very much in love with him and suffers much grief as a result of his death. With this production, not all the talent was on stage. 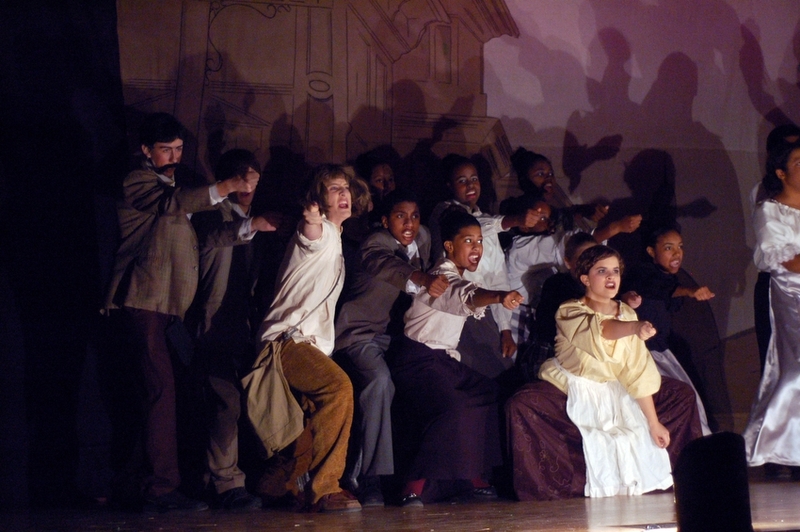 Throughout the play, musical numbers were sung by the actors, but the music was performed by the Bishop McNamara Pit Orchestra. Though the instrumental balance was at times rough and some instruments were a little pitchy, the overall quality of the music was enjoyable and was clearly practiced a lot. 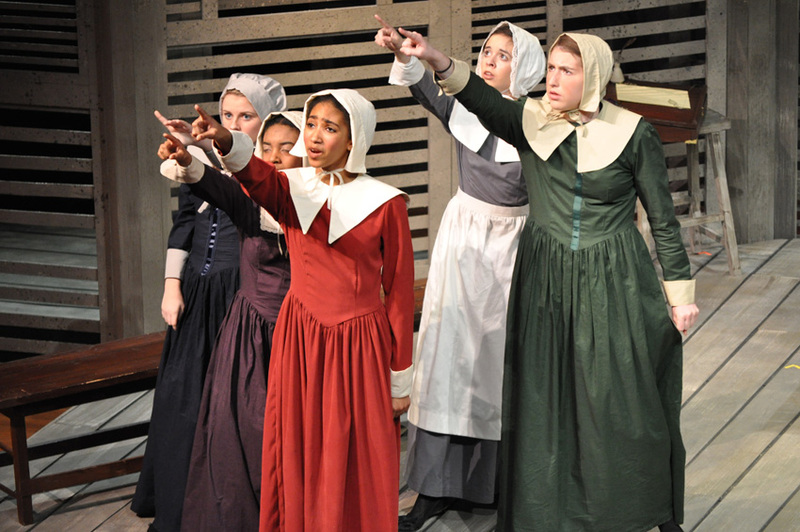 The play was delivered beautifully, through song, dance, and dialog. Though there were a few minor technical problems, such as falling sets and dropped props, the overall outcome was a great success and was enjoyed immensely by the audience. 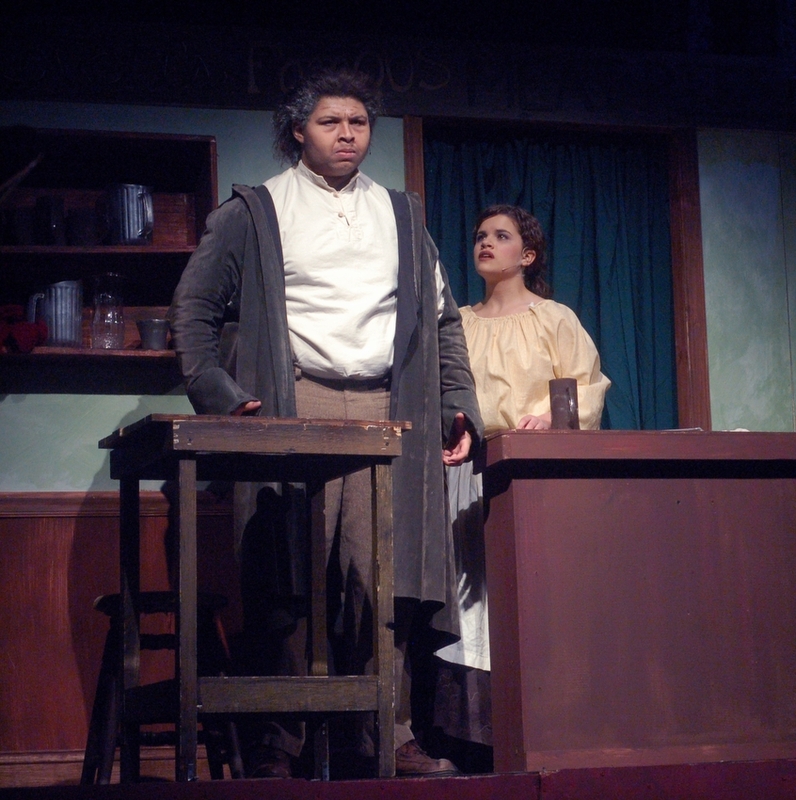 See our Review of Sweeney Todd the Musical for the complete story. 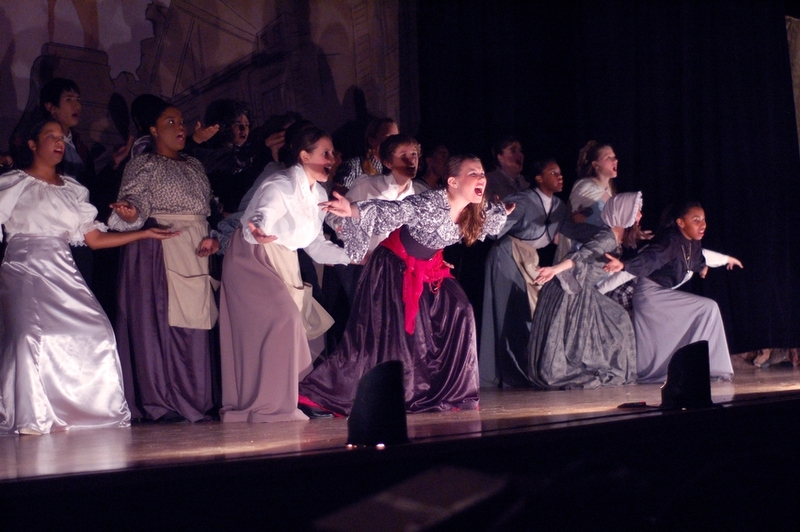 The chorus from Sweeney Todd kills the audience with their powerful voices and outstanding energy. PHOTO GALLERY. Click on image to see caption. Scroll with arrow keys or mouse. **Update DEC. 2009 — The lead photo in this series won Honorable Mention for Photography in the Maryland-District of Columbia Scholastic Press Association’s 2009 Individual Writing and Editing Contest Awards, Newspaper Division.